This peak is #80 on the Height List for Utah . 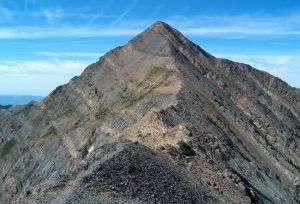 This peak is #5 in Prominence List for Utah .The highest mountain in Utah's Wasatch Range. It's a triple summit with a knife ridge connecting each highpoint. The standard route follows a trail that leads to the lower south summit. The higher north summit is then an exposed walk. Name Notes: Named after the biblical Mount Nebo which overlooks the country of Israel and is said to be the place where Moses died.